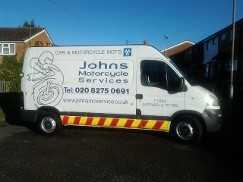 John's Motorcycle Service is one of the leading motorcycle repair garages in Hertfordshire thanks to our specialist knowledge of the unique requirements of your motorcycle. As experienced and friendly mechanics, you can rest assured that the service you receive at John's Motorcycle Service will be first rate. As we are not VAT-registered, we can pass our savings directly to our customers; therefore, you will always find our prices competitively low. John Savill founded the company based on the principle that our work is guaranteed and skillful, provided with consistent efficiency and reliability for the satisfaction of our customers. Our specialists are here to offer you the friendly and personable service that you deserve. Our team can undertake any necessary repair work to get your bike ready for the MOT test. We are well-versed in the steps needed to pass your bike, so we can go over all major points with you before putting your bike through its test. The mot test is carried out on site whhile you wait or you can leave your bike with us for the day. We also carry out car mot's on site, please call for a booking. Contact us for more information on any of the repair and maintenance services we offer for your motorcycle. Opening Hours: Monday – Wednesday, 9:00 A.M. – 5:30 P.M. | Friday, 9:00 A.M. – 5:30 P.M.